Create perfect symmetry throughout your event by finishing your table with our sophisticated gourmet table skirts. 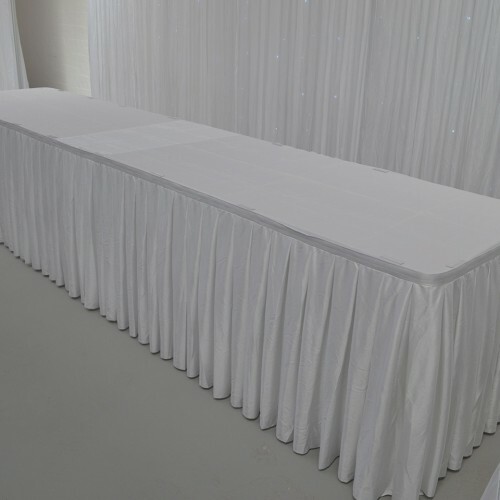 Perfect for hiding table legs and making for a more elegant look within a room, our stylish wedding table skirts look amazing when used in conjunction with our range of table linens, including cloths and swags. Our innovative clips and Velcro straps along the top of the linens makes set-up easy. At the end of the night, when an event planner’s work is almost done, removing all the table skirting is just as simple. 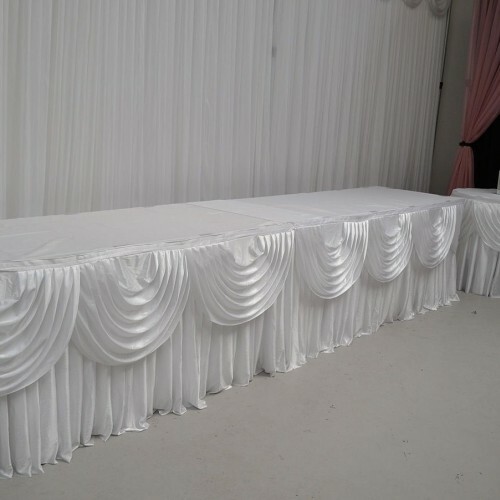 Whether you intend to skirt an entire room of tables or are just thinking about how to decorate a top table or a cake table, these stunning banquet table skirts hang beautifully, featuring pleating for the best finish. When completed with our LED lighting kits, they make for a breath-taking look that is certainly something to admire. We have fabric table skirts in a wide variety of colours, so that there is sure to be something to match your event theme or stick with classic bridal white and add a flash of colour in your other linens. 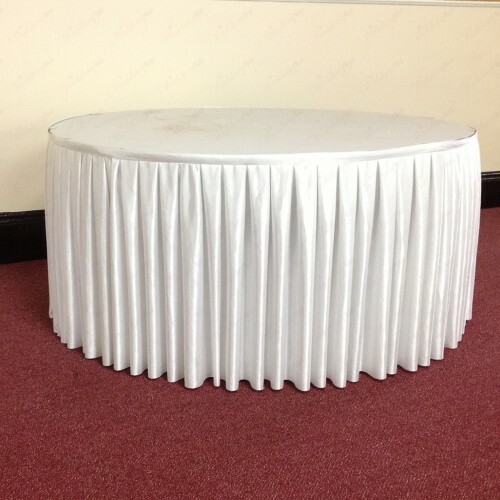 Our conference table skirts also come in various shapes, so that you can pick the one that will best wrap around your tables. WeddingMart is proud to be the UK’s leading wholesaler of wedding linens, offering bulk and wholesalers prices in order to keep the increasing costs of wedding and event planning down. Our high-quality manufacture ensures our table skirt designs are easy to use, durable and strong, ready for reuse again and again – making them ideal for event organizers to use at weddings, fundraisers, awards and all kinds of other high-end occasions. For those times when speed is of the essence, our next day delivery is sure to be an essential addition to our excellent service.